The all new India -spec Nissan Kicks SUV is available in 11 colors. Check out the full list of all Nissan Kicks Colors in this article. Nissan Kicks is the much awaited SUV from Japanese based carmaker Nissan India. Nissan Kicks SUV is priced aggressively at Rs 9.55 Lakhs. The all new Nissan Kicks India Model is offered in 4 variants and 11 different colour shades. In this article we discuss all the color options available for recently launched Nissan Kicks SUV. Four out of 11 colors offered in Nissan Kicks are dual-tone colors. The all new Nissan Kicks is launched in Pearl White color. 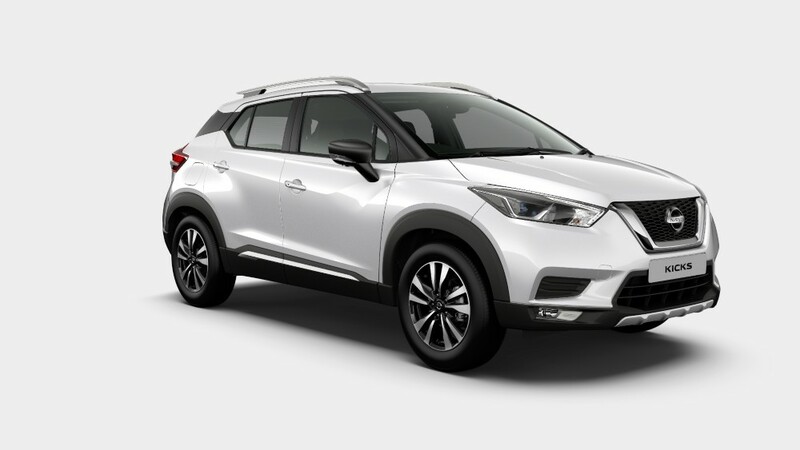 Check out the photo of 2019 India model Nissan Kicks in White color (Pearl White). The all new Nissan Kicks is launched in Blade Silver color. Check out the photo of 2019 India model Nissan Kicks in Silver color (Blade Silver). Get New Nissan Kicks for Test Drive! Provide your details so that we can arrange a test drive of all new Nissan Kicks for you at your place! The all new Nissan Kicks is launched in Bronze Grey color. Check out the photo of 2019 India model Nissan Kicks in Bronze color (Bronze Grey). The all new Nissan Kicks is launched in Fire Red color. Check out the photo of 2019 India model Nissan Kicks in Red color (Fire Red). The all new Nissan Kicks is launched in Amber Orange color. Check out the photo of 2019 India model Nissan Kicks in Orange color (Amber Orange). The all new Nissan Kicks is launched in Deep Blue Pearl color. Check out the photo of 2019 India model Nissan Kicks in Blue color (Deep Blue Pearl). The all new Nissan Kicks is launched in Black color (Night shade color). Check out the photo of 2019 India model Nissan Kicks in Black color (Night Shade). The all new Nissan Kicks is launched in Red and Black dual tone color. Check out the photo of 2019 India model Nissan Kicks in Red with Black dual-tone color (Fire Red + Onyx Black). The all new Nissan Kicks is launched in Bronze and Orange dual tone color. Check out the photo of 2019 India model Nissan Kicks in Bronze with Orange dual-tone color (Bronze Grey + Amber Orange). The all new Nissan Kicks is launched in White and Black dual tone color. Check out the photo of 2019 India model Nissan Kicks in White with Black dual-tone color (Pearl White + Onyx Black). The all new Nissan Kicks is launched in White and Orange dual tone color. Check out the photo of 2019 India model Nissan Kicks in White with Orange dual-tone color (Pearl White + Amber Orange). Out of 11 different colours available for Nissan Kicks – which one would you like to prefer?